Organizing receipts is a tedious job. Whether in your personal finance or business, you will want the most efficient way of keeping your receipts for end of year tax breaks and audit. That’s where a receipt scanner comes in. All you have to do is scan, keep a digital copy, and get rid of the paper receipt. What a good way to go paperless and have a neat office at the same time. Just in case You’re looking for a printer to print all those documents, be sure to check out our buyer’s guide and top 12 laser printers comparison and reviews. And now let’s take a closer look into each device separately. Are you looking to reduce your overall tax burden? Keeping your receipts is a good place to start. Avision is a small portable scanner that is a steal for everyone who is always on the go. Being compact means, it can store in your briefcase or laptop bag without hassle. If you have so many documents that you want to move into a digital format, you cannot depend on an app to do the scans. It can be a tiring process, and Avision takes the central role in making the process fast and accurate. It is a reliable piece of equipment that uses a rechargeable Lithium-Ion battery. The scanner goes cordless, so you don’t have to deal with wires during travel. We like that it has different scanning options including to an SD card or USB drive. It does not require being connected to a computer. When you insert an SD card, scans are automatically saved in JPEG, TIFF, or PDF format. It is such a straightforward way to start carrying your scans with you. Avision has a 600dpi resolution. It is top quality for color and grayscale scans. It scans grays at 16 bits and color at 48 bits. With its Twain driver, the scanner provides automatic crop and color detection plus threshold imaging features and de-skew. Avision IS25 has a maximum document size of 8.5inches by 11.7inches. This feature makes it a good pick for receipts as well as business cards, plastic ID cards, brochures, and photos. The main snag of this model is that it cannot be used when charging. You have to wait for the battery to get charged to use the scanner again which takes around six hours for only 2-3hours of use. Another drawback is that you cannot change the 600dpi to a lower 300dpi. Verdict: Avision IS25 is a reliable portable scanner that is perfect for digitizing documents. With a rechargeable battery and different scanning modes, you are set for a smooth time whether at the office or on the go. It takes a little space both on a desk or in a bag. If you are not scanning over 200 receipts at one time, you will find this model beneficial. Vupoint ST470 brings flexibility and versatility in one small machine. It has a larger scan area meaning you get to scan more sizeable receipts. This scanner has dual scanning methods. 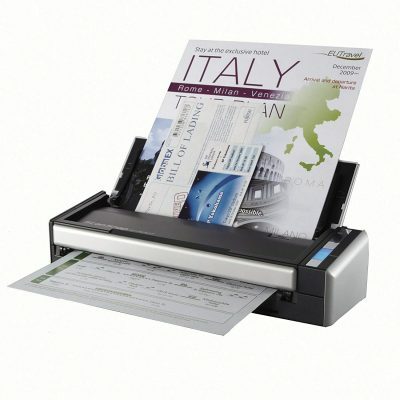 One, you can use the automatic document feeder, or you can drag the scanner over a page to use it as a magic wand. It has a 1.5-inch color LCD screen that allows you to see the thumbnail of your document such that you can tell if it is the correct quality before proceeding to the next step. Vupoint ST470 scans in color and black & white. It saves images directly to an SD card in JPEG or PDF format. Your first SD card of 8GB is provided enabling you to store up to 5,000 files. For more space, you can use a much larger SD card up to 32 GB. It has insane scan speeds at two seconds for receipts that are as large as 8.5 inches wide and 125 inches long. Not to mention it has three resolution levels including 300, 600, and 1050dpi and 1200 when it is docked. You also get an OCR editing software which will come in handy when you want to convert your scans into editable and searchable documents. The thumbnail preview adds a nice touch to this scanner. But you will notice that it presents images as longer and thinner than actual scans. This may be good if all the specs are clear and ideal for your scan, but it may hide a distortion which appears only in the final scanned image. Verdict: Every small and busy office needs a good receipt scanner. And when you can’t afford wasting time and making mistakes, a scanner with thumbnail preview comes into the picture. Vupoint provides that extra ounce of accuracy so that you can make smooth scans the first time around. It’s hard to pass an inexpensive receipt scanner. When you are always on the move, depending on an app for your scans is not how you put your best foot forward. Visioneer RoadWarrior X3 is a lightweight scanner designed to be your best companion on business trips. If you have to keep copies of hotel receipts for refunds and also need to scan a few documents on the side, having a reliable scanner is a must-have. This particular model is simple in that it supports single-sided scanning through its manual document feeder. It has to be connected to a computer using a micro USB card which also acts as the power source. It gives you a continuous method of performing scans instead of depending on a rechargeable battery where if it dies on you, it will take hours before you resume scanning. This scanner has a ton of software. Visioneer Acuity provides perfect scans by using dynamic thresholding and advanced algorithms which is to say your documents will have better quality. Every scan is readable, and it also increases OCR accuracy. The scanner has Nuance OmniPage Ultimate, Nuance Paper Port, Nuance Power PDF, ABBY Business Card Reader, Visioneer OneTouch, and Visioneer Scan Utility. For Mac users, you get to use the Mac Twain driver which offers all Acuity features. Scanning with this model seems to be a bit slow compared to other products. This is because it does not support dual-sided scanning and using it to scan multiple pages onto one page, results in skipped pages. Verdict: Consistent scanning saves you time. 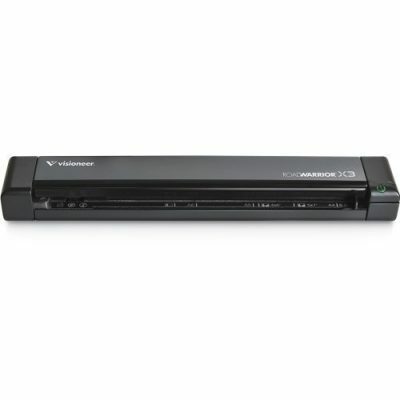 Visioneer RoadWarrior X3 provides that consistency with better quality than other scanners its size. It opens up possibilities of scanning lots of other different documents, so it is not just your receipts that get to benefit. Talk of convenience and think about Doxie Go-SE scanner. It is the size of a rolled-up magazine, yet it can scan full-size pages in only eight seconds. At the heart of this scanner is Doxie software that scans and sends pages directly to the cloud. It uses ABBYY OCR technology which allows your scans to be text editable and searchable. It can create multipage searchable PDFs which is essential when you have lots of receipts that you need to see in one page. With this scanner, you don’t need to fumble with drivers and installation of software. It is ready to scan as soon as it is turned on when new. Its auto-adjust system applies auto contrast, de-skew and automatic cropping to all your scans. It is a remedy that saves you time and energy of going back to the settings every time you feed a document. Like other scanners its size, it uses a rechargeable lithium-ion battery that offers up to 400 scans per charge. It will scan onto an SD card that can store up to 4000 files. Since Doxie is cloud-ready, it becomes much easier to organize your other documents to the relevant apps like EverNote, iCloud Drive, or Dropbox. This product does not support duplex scanning. It can be a slow process if you have stacks of receipts that have notes on the other side since you will be manually flipping the paper for the unit to scan both sides. Verdict: If you are after simplicity and reliability, you have a winner with Doxie Go-SE. It makes for a perfect organizing tool because it can save files to the cloud and it has efficient multiple-page scanning and searchable PDFs. The scanner is compatible with Mac OS 10.7+ and Windows 7, 8, and 10. Fujitsu is renowned for their high-end office products. 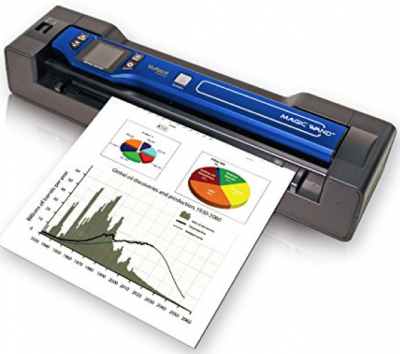 The ScanScap iX500 is an excellent option for the busy office. From receipts to business cards, this scanner is fast and without misfeeds. The overall exterior look of this scanner tells you this is a sophisticated scanner. It is not ideal for on the go, so you better spare some space on your desktop. Its fast speeds and duplex scanning are some of the features that have propelled it to the top. This scanner saves files into searchable PDFs in a glimpse. No time to waste scanning, storing, and locating your files. Instead of rifling through stacks of paper, you can be done scanning up to 25 double-sided pages in a minute. It offers the saving of files directly to the cloud like Dropbox Evernote, Google Drive, etc. Fujitsu iX500 can connect via Wi-Fi as well as USB. You can opt to go wireless and send files to your desired apps to access at any time and place. It also incorporates Intelligent Scan Correction that offers automatic adjustment of document quality including removing blank pages. This scanner has specific receipt scanning software. You not only scan and save receipts, but you can also categorize expenses by creating a memorable and relevant title to a specific category. The software also allows you to tally up totals and export files to Excel. If you are a Mac OS user, this scanner does not have an Adobe Acrobat XI for you. The scanner may also come with dated Nuance PDF converter that also affects Mac users. Getting Fujitsu to reply to your queries is also a headache as they have a poor customer support system. Verdict: In finding organizing solutions, Fujitsu ScanSnap iX500 falls in line with just the tools to do it right. From its receipt scanning software to double-sided scanning and superfast speeds, it achieves accuracy and excellence when digitizing documents including your precious payment records. Fujitsu S1300i ScanSnap is your ideal on the go scanner with color and duplex scanning. It is a well-rounded receipt and document scanner that will give you the most hassle-free method of scanning. 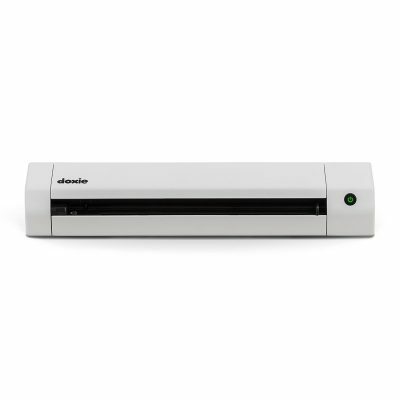 ScanSnap S1300i performs automatic multipoint check so that you don’t have to do it. It performs automatic color detection, and it crops the document to the right size. It also de-skews pages, reorients upside down documents, and removes blank pages. 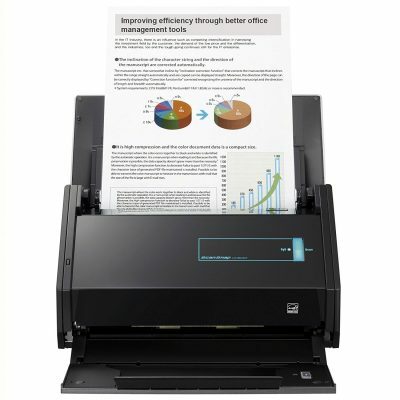 This model performs up to 12 pages of double-sided and colored scans per minute. Whenever you have lots of receipts, documents, and photos to scan in limited time, ScanSnap S1300i comes through for you. It can also scan directly into searchable PDF. It comes with ABBYY OCR software that converts your documents into editable files. This means if you have a receipt whose total did not appear in the scan, you can always add it. The scanner also allows scanning into cloud apps Dropbox, Evernote, Google docs, and many others to give access from anywhere. ScanSnap S1300i is USB or AC powered. It can draw power directly from your computer meaning you get to use it anywhere. It has SnapScan receipt scanning software, and it can convert business cards into editable contact data. This scanner cannot handle stacks of paper. Even with the advertised 12 pages per minute, it may take longer because of the reported stuck pages through the feeders. It indicates you will have to spend more time removing the papers than scanning which can be frustrating. Verdict: Fujitsu ScanSnap S1300i is a definite pick for premium quality in a portable scanner that has duplex scanning. It works efficiently to save you time thanks to the multipoint document checker, and different software that provides simple organizing tools. Epson ES-500W has a lot going for it even though most people refer to it as an entry-level receipt scanner. It offers wireless scanning capability which indicates it can scan to your computer, mobile phone, or tablet for your convenience. It is just what you would pick for a small business, when you would like to access documents out of the office. This scanner is Mac and PC compatible. It can scan stacks of receipts thanks to the 50-sheet document feeder. The result is up to 35 pages per minute that are double-sided. It includes software that converts your receipts into editable documents such that you can fill in the relevant notes concerning a particular payment. It can also scan into searchable PDFs. It improves your document quality by including automatic contrast addition as well as auto crop and eliminating of blank pages. It has a Twain driver that provides compatibility with almost any document management software so that there are no restrictions to using only a certain kind of software. We like the slow speed button because it is essential when scanning receipts that are too thin or are delicate especially if they have been in a file for too long. You will be happy with the double feed detection skip button since you can resume scanning without the unit going over the stack of pages again. How’s that for intuitive? Setting up and using this unit seems to be a hassle. The wireless connection option requires having an application running on your PC. The application terminates itself after 15 minutes. You will have to use a wired connection via USB to keep scanning or install the app over and over again each time you need to scan and transfer wirelessly to a computer. 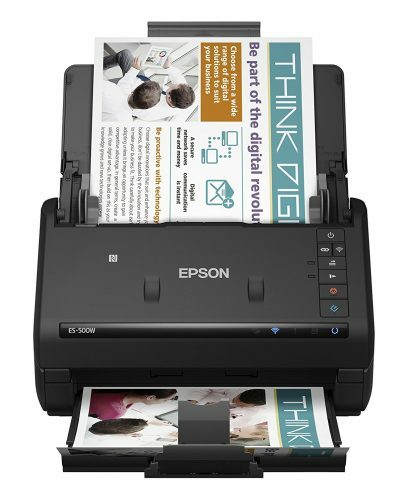 Verdict: When you want to reduce clutter because of having too many receipts lying around, Epson ES-500W is the way to go. It is an incredible desktop scanner that provides so much more than receipt scanning. For documents that you want to access anywhere, wireless transfer allows a fast way of getting your receipts on your smartphone or tablet. 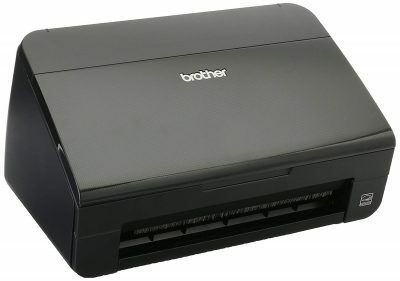 For those looking for a light-duty scanner, Brother DS620 is an outstanding choice. You will have to forego an automatic document feeder and duplex scanning to get portability and affordability. Brother DS620 is perhaps the best scanner for receipts because it is compatible with BR-Receipts. This software offers seamless scanning of receipts, searching, reading, and organizing of the receipts. It also allows storing of receipts locally or on Brother cloud. The software can create reports and save files in the desired format. Not to mention it can also transfer to Quickbooks and Quicken software. This scanner provides color scanning with speeds of up to eight pages per minute. Weighing less than a pound and under 12 inches long, this scanner is compact. It is a good partner on the go since you don’t need to go looking for a briefcase that you do not already have. The scanner connects directly to a computer where it draws its power. As long as your computer is powered, you can scan all critical documents without missing deadlines. The scan quality is also remarkable. It can produce up to 1200dpi interpolated images or 600dpi optical images. With its scanning software, Brother DS620 allows managing of scans to eliminate the need to store hard copy documents for reference. This scanner also offers scanning to a printer, FTP, email, or shared folder. Brother DS-620 is compatible with Windows, Mac, and Linux OS thanks to the inclusion of Twain and SANE drivers. If you are only scanning receipts, you only need to create one folder for them. But for multiple documents such as business cards, photos, brochures, ID cards, etc. you will have lots of folders. It does not have a shortcut to get to the folder, so it takes time navigating through your search browser to get to the ideal folder. Doing it every day is kinda annoying. Verdict: Brother DS-620 delivers quick scanning of receipts, plastic ID cards, business cards, photos, and any other document that you would like to digitize. Its small weight is a major attraction of this model since you won’t need to factor in its weight when you are bringing a laptop and other devices on your business trip. It provides simplicity and convenience when you need it. This scanner brings versatility to the table. It can scan to email, Android phones, and USB keys. Brother makes it a straightforward process by having a set of user controls. Brother ImageCenter ADS-2000 has been around for a while. You may notice its scan quality is not as perfect as cheaper and smaller scanners. But it includes features seen in high-end models. It has duplex scanning of up to 24 pages per minute in both black and white and color scans. Its 50-sheet auto document feeder allows scanning of a stack of receipts in one standing. It can scan different receipt sizes so whether it’s a paid invoice or your house rent receipt, it will not reject a single document. It has multi-feed detection which comes in handy to prevent skipped pages. The scanner can also stitch two documents together using the 2-in-1 mode. You will like that it supports different drivers including TWAIN, WIA, ISIS, and ICA to allow scanning to an application of your choice. It also has Nuance PDF Converter Professional 7, Nuance PaperPort 12 SE, Presto! PageManager 9 for Mac, and Presto BizCard for Windows and Mac. The latter is OCR software that helps to scan and send docs to the cloud. The scanner also has an adjustable dpi which can help you get a higher scanning speed, especially in duplex scanning. At high dpi, this scanner slows down significantly only managing eight pages per minute. For a scanner that is supposed to get through 50 page in the document feeder, it should have worked seamlessly. Verdict: Brother ImageCenter ADS-2000 has intuitive software that gives it a pass for the price. It remains highly functional for a small business that needs a speedy way of scanning receipts and retrieving them. It is open to the document sizes, so you are not limited to receipts. This scanner speaks of elegance and style. It blends with home décor so it can sit alongside your TV without sticking out. For all the receipts that you collect from the mail, this scanner provides photo-quality scans. Canon LiDE120 has a 2400dpi resolution. It indicates the quality and the color it gives to all your scans. It has built-in OCR such that you can scan into editable format documents as well as searchable PDF and image PDF format. 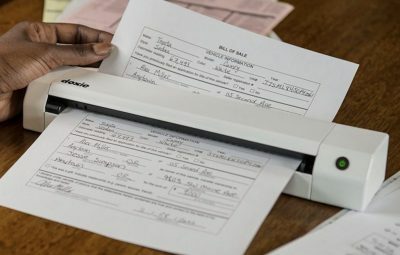 The scanner has an automatic document fixer which helps to create perfect scans such that it can resize and add the needed color in the scanned image. The automatic scan mode allows saving of the scans in the ideal format. This way, you don’t have to go back to the controls to figure out the right settings. It has only four EZ one-touch buttons so mastering the functions should be a breeze. In the setup, it also includes TWAIN and WIA drivers that allow scanning from any desired software. With the TWAIN driver, you can have more settings that open up advanced scanning features. But if you are not tech savvy, it is better to stick to the basic features. The fact that it connects via USB to a computer means that it can scan continuously. It does not depend on the battery, so no worrying about the recharging time. When connected to a PC, Canon LiDE120 can scan directly to the cloud. This counts for such destinations such as email, Dropbox, and, Evernote. 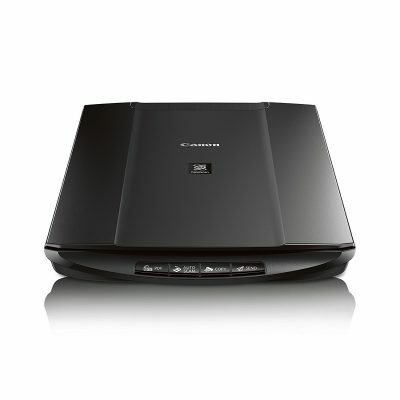 A unique feature of this Canon LiDE120 is that it can scan large items like a notebook using the Z-Lid Expansion Top. The lid raises up to 1-inch higher to facilitate scanning. This scanner is only applicable for light duty purposes. If you have stacks of receipts, the lack of an automatic document feeder makes it less than convenient. The scanner also loses formatting when converting documents into editable texts. Verdict: Canon LiDE120 is a top pick for photo-quality scans. Being able to preserve your receipts in the best quality possible on the cheap is what this model is all about. It provides crisp, clear scans that will never need referencing to the hard copy. Now you can declutter knowing every scan is reliable. This scanning app lets you take photos of receipts and notes. It is a good alternative if you don’t deal with too many receipts. It can convert your images into editable text as it also integrates OCR. You can save, crop, rename and choose a destination folder for the scanned copy to enhance its organizing purpose. This app lets you manage receipts fast and easy wherever you are whenever you need it. Shoeboxed is available for iOS and Android. There’s a free and paid version of the app. Paid plans provide scanning, OCR, and data verification for receipts as well as business cards management, and expense reports. You can send the scanned receipts to email or import photos from an album. It opens up so many possibilities for the small business running at minimum costs. This app transforms your smartphone into a receipt scanner by simply taking a snap of the receipt. It can attach the scanned receipt to the expense in your books and the digital file is saved for future reference. Anyone can benefit from a receipt scanner. When you no longer want to deal with consoles, cabinets, and shoe boxes filled with receipts, grab one our Best Receipt Scanners and start decluttering. Now you don’t need to go back and forth in stacks when referring to a particular payment. With one of our models, get organized and keep everything at your fingertips.